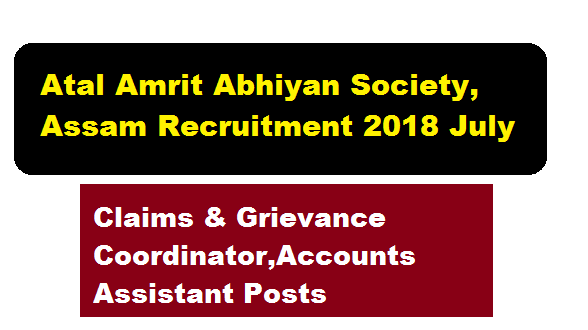 Atal Amrit Abhiyan Society, Assam Recruitment 2018 | Claims & Grievance Coordinator,Accounts Assistant Posts :- Hello , welcome to a new Job news in Assam. In this article we will be talking about a new Recruitment in Atal Amrit Abhiyan Society, Assam. According to the latest Atal Amrit Abhiyan Society, Assam Recruitment 2018 July, Atal Amrit Abhiyan Society, Assam a Society notified by the Govt. of Assam and registered under the Societies Registration Act, 1860 for implementation of Atal Amrit Abhiyan Scheme, a unique Health Assurance Scheme in the State aimed to provide critical care health assurance coverage to BPL population and Low Income households, invites applications for the posts of Claims Coordinator , Grievance Coordinator,Accounts Assistant. We shall discuss more about AAA Assam Recruitment 2018 below. In this section, we will discuss in detail about Recruitment of various posts under Atal Amrit Abhiyan Society, Assam Recruitment 2018 July with all the details and requirement. Eligible & interested candidates may visit http://aaa-assam.in/careers.aspx#tblapply for submission of online application.